Every movie portrays hackers in pretty much the same way. When it comes to crunch time, they crack their knuckles, sit down at the keyboard, and begin tapping away at lightning speed. The timer is ticking down, the music reaches its peak of tension, but the hacker remains cool as a cucumber. Within seconds, they’re in, they’ve “hacked the mainframe” and prompted high fives from their swarm of cohorts waiting in the wings with bated breath. In reality, hackers are rarely up against some impenetrable digital fortress, digging into the passwords of a megacorporation or the US government. The vast majority of the time, they’re nothing more than a ragtag group of bored criminals up against some unassuming small business. 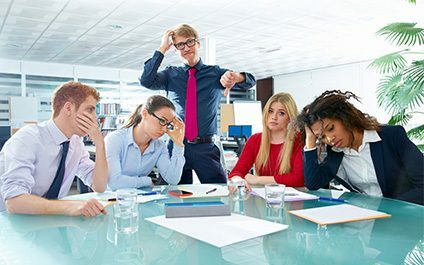 And more often than not, netting thousands of dollars from ordinary businesses just going about their day-to-day routines requires little coding at all, and certainly no “mainframe hacking.” According to IBM’s 2016 Cyber Security Intelligence Index, 60% of the time, all it takes is an unwitting insider to accidentally leave the company’s digital front door wide open. Cybercriminals may be experts in sniffing out the slightest vulnerability in your company’s security, but a lot of the time, the data they need practically falls into their laps. Every day, internal e-mails are mistakenly addressed to the wrong people, sensitive info is inadvertently made public and employees unknowingly click on malicious links. As technology has progressed, the number of potential threats has increased exponentially. Average Joes simply can’t be bothered to keep up with hacking trends, and therefore are prone to opening your business up to cyber-attack by simply bumbling through their daily activities. If they’ve never been taught, how could they possibly know otherwise? One of the easiest ways hackers can gain access to your business’s valuable data is by posing as a trusted figure within your organization. This may sound complicated, but in today’s world of social media and constant interactions through screens, it really isn’t. Hackers can use data pulled from Facebook to either hijack the e-mail accounts and identities of employees or pretend to be them outright. After that, they can send peculiar requests to other members of your team. After all, if your CEO, Controller, or Office Manager sends you an urgent e-mail, you’re probably going to open it. In many cases, by gaining access to a particular team member’s credentials, hackers can bring down barriers and decrease the effectiveness of your security network, while staying completely invisible. No matter how comprehensive and powerful your cyber security software may be, it’s not going to do much if an unsuspecting employee welcomes the bad guys into your network. With that in mind, it’s vital that we provide specific training to our teams to truly make data security a priority. Giving employees a crash course on contemporary hacking strategies. You’ll likely be shocked by how many of them don’t even know what phishing is. During the training, we will provide specific examples of potential attacks - especially phishing - and how to avoid them. Putting systems in place empowering employees to alert the organization of vulnerabilities. For example, if John in manufacturing receives a suspicious e-mail, the entire company should be on the lookout within minutes. Teaching your employees that software updates and patches are more than just a nuisance, they’re a necessity for up to-date security. When a new patch for a key program is released, we’ll make sure your team knows it’s available and that they shouldn’t avoid installing it until later, and provide them with the tools to make it happen. Testing your team on what they’ve learned, such as sending out false suspicious e-mails containing shady links. If anybody fails the test, there’s still work to do. Your people are your greatest asset, but they can also be your biggest liability. In the modern world, it can feel impossible to protect yourself from data breach. Luckily, when it comes to your team, there’s one potential avenue for hackers you can fix with a little perseverance.